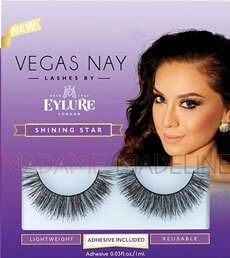 Vegas Nay Shining Star False Lashes by Eylure is a cool, textured style with pointed tips for a fabulously full lash. This style has a thin flexible lash band for easy lash application. Every makeup fan knows, a fabulous eye look isn’t complete without the right false lashes. Beauty guru and YouTube blogger Vegas Nay recently collaborated with Eylure to create her own line of false eyelashes! The Vegas Nay by Eylure Collection is a Gorgeous jewel-toned packaging enhanced with gold, a perfect reflection of her flawless profile. This collection features four 100% natural hair, lightweight lashes each with a back of pack that is individually tailored to show exactly what the lashes can do. Say hello to gorgeous lashes!